This Article summarizes the concepts of final molasses generation in process, Properties Molasses like viscosity, specific heat.Also discussed to overcome the issue of deterioration during storage. 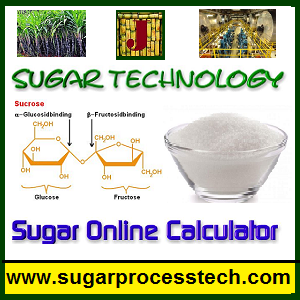 Molasses cooler design concepts and its water requirement calculation. Final Molasses is one of the important & valuable byproduct of the sugar factory. 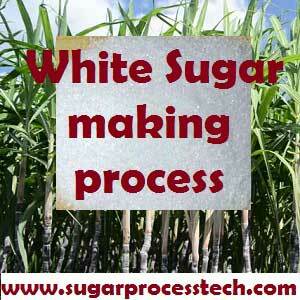 Its quantity is generally upto 4 – 5 % of the cane crushing capacity. It is a common practice that in all of the sugar factories the final molasses produced during the crushing season is stored in the storage tank. This storage tank is called as molasses storage tank. Molasses deterioration is a common phenomenon during storage in the tanks. Molasses has a tendency to undergo rapid destruction & ultimately leading to know about spontaneous combustion. The phenomenon of spontaneous combustion occurs purely by virtue of certain chemical reaction. Basically it is an “exothermic reaction”. This combustion is due to the reaction of unstable organic substances (Originally produced by the action of lime upon the reducing sugar of cane during clarification ) with further quantities of reducing sugar in molasses which results in the formation of dark coloured colloidal impurities of high carbon content. The deterioration of the molasses through the Maillard reactions leading to catastrophic consequences. The Maillard reactions are initiated/accelerated with higher temperatures during storage with the release of gases (mainly carbon dioxide) and foaming in the molasses tanks. In case of certain factories when the low grade massecuite are boiled at a little high temperature. The certain ingredients of molasses are over heated & thus causing higher carbon content. After centrifuge the the final molasses sent to storage tanks with high temperature means without cooling it. The open tank in which the molasses is stored are exposed to the direct heat from the sun. With the direct heat of sun entering in the molasses, the combustion is helped by the higher temperature of the heat of the sun particularly in the month of summer. There must be throughout cold water recirculation arrangement around the wall of the tank in day of summer season. Appropriate venting in the molasses stored tank. Viscosity of a Newtonian liquid is measured as the ratio of shear stress to shear rate. If a viscometer is used to measure the consistency of a non-Newtonian fluid, the relationship between shear stress and shear rate is the apparent viscosity. The viscosity of the molasses, which depends on its temperature and purity. The viscosity of molasses increases rapidly as its temperature decreases. It is approximately three times as high at 40°C as it is at 50°C. Viscosity increases’ equally rapidly with the brix. Viscosity also increases with the proportion of air entrapped in the form of fine bubbles in the molasses. For example with 10% and 20% by volume of entrapped air, the viscosity may be respectively 15% and 50% higher than it would be in the absence of included air. This varies according to the dissolved solids content and the degree of aeration. It usually has a value between 1400 and 1450 kg/m3 when not aerated. 2. Plate type heat exchanger. Heat transfer rates are high in plate type design when compare to shell and tube design. So plate type heater coolers are compact and relatively less expensive to install. Moreover viscosity has a substantial effect on performance of plate type design. Due to high viscosity of molasses and pressure drops, plate type cooler is not a successful design for this application. However some designers modified in plate patters of cooler to overcome the drawbacks of this system. Shell and tube is one of the successful design for molasses cooling application. Tubular cooler with water inside the tubes – In this design involves the flow of molasses over banks of small diameter tubes through which cooling water flows. i.e Molasses passes through shell side of the heater and water flows through the tubes. Generally water side scale formation is high when compare to molasses side according to their properties so it will be the main advantage. Proper baffles arrangement in shell side is also important criteria for this type system. 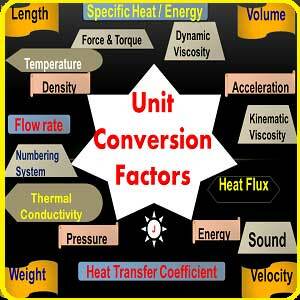 But in this system heat transfer rates are low when compare to another type systems. Another drawback is pressure drops is higher. Tubular cooler with molasses inside the tubes – In this design involves the flow of water over banks of small diameter tubes through which molasses flows. Velocity of molasses in the tubes is expected around 0.20 m/sec. to 0.25 m/sec. ∆Tm (true) = True temperature difference, the mean temperature difference for use in the above Cooling surface formula. Ft = the temperature correction factor. R is equal to the ratio of “shell-side fluid flow-rate times the fluid mean specific heat ” to “tube-side fluid flow-rate times the tube-side fluid specific heat”. S = the temperature efficiency of the exchanger. The equation for a one shell and two tube pass exchanger can be used for any exchanger with an even number of tube passes. 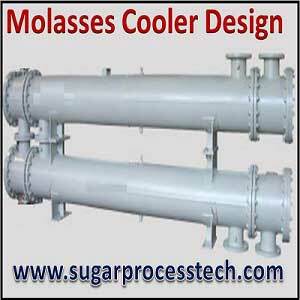 Hi friends Thanks for reading this article “Molasses cooler concepts”. I Hope you liked it. Give feed back, comments and please share it. Pleas need to calculated of prelimer capacity with 11000 beet ton /day .